My kids are at the age where they love tick tack toe and other similar games. 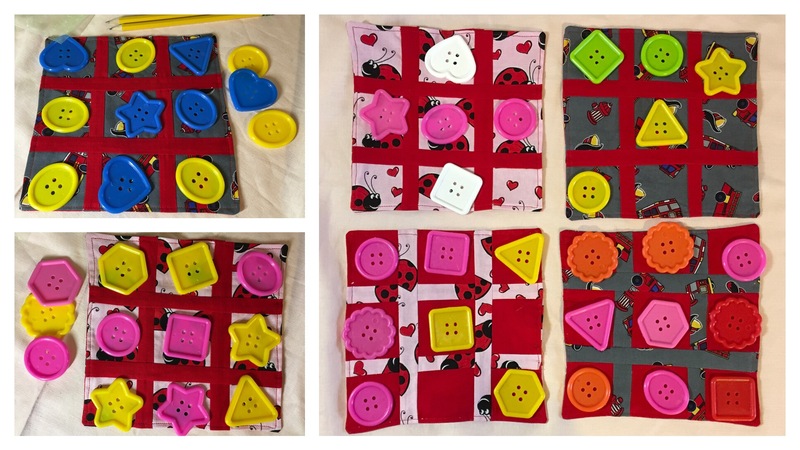 I thought it would be nice to make a tick tack toe board for them to use when out and about. I was thinking of making some for younger kids, so I wanted to have the playing pieces about 1 1/2 inches big. 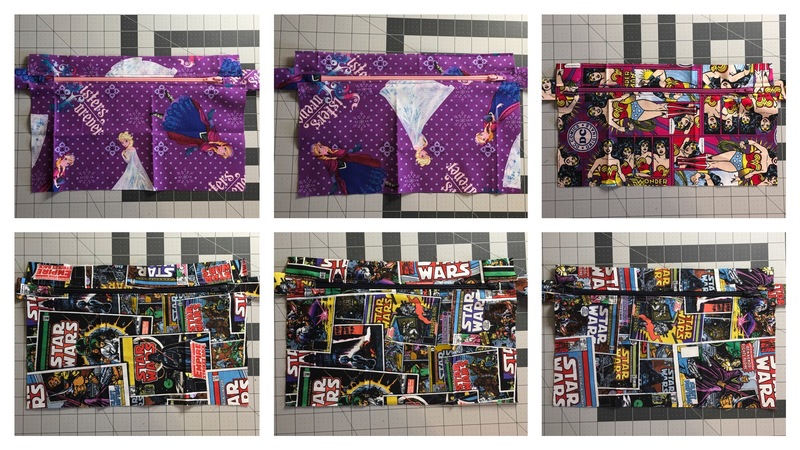 I also wanted the front and back to be opposite fabric, both being fun looking for the kids. It’s a pretty easy project! You need two different pieces of fabric, one with a pattern and another solid color that matches the pattern. First I cut three (3) 2 1/2 inche strips from both the pattern fabric and the solid fabric. 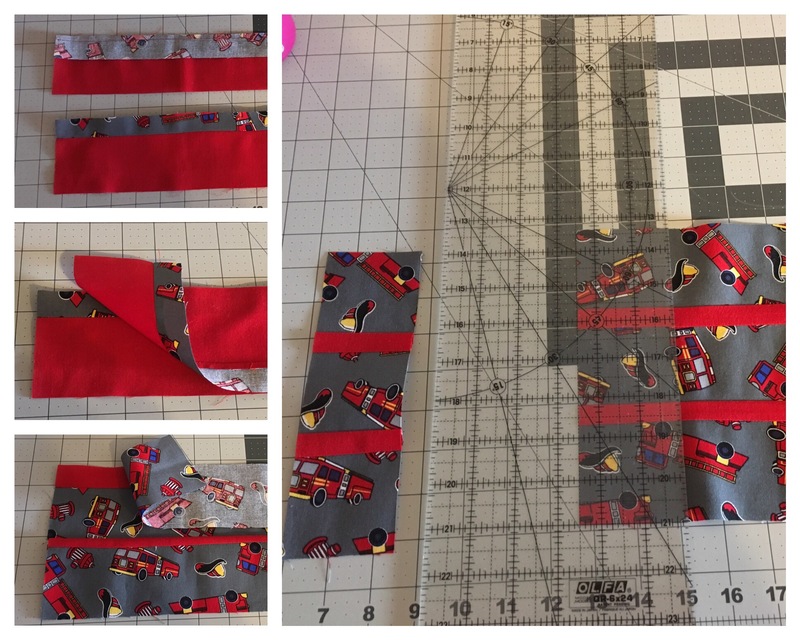 Then cut two (2) 1 inch strips from both the pattern and solid fabric. 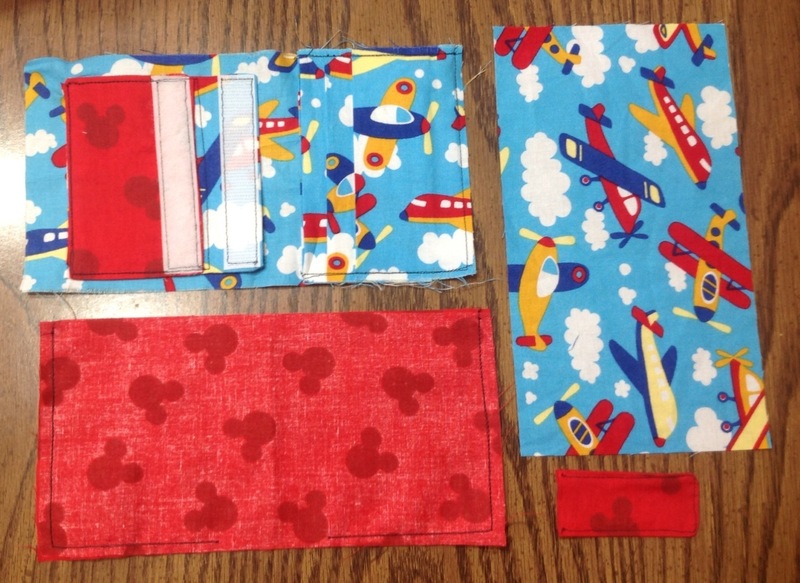 Take one piece of 2 1/2 inch pattern fabric and sew the 1 inch strip to the fabric. 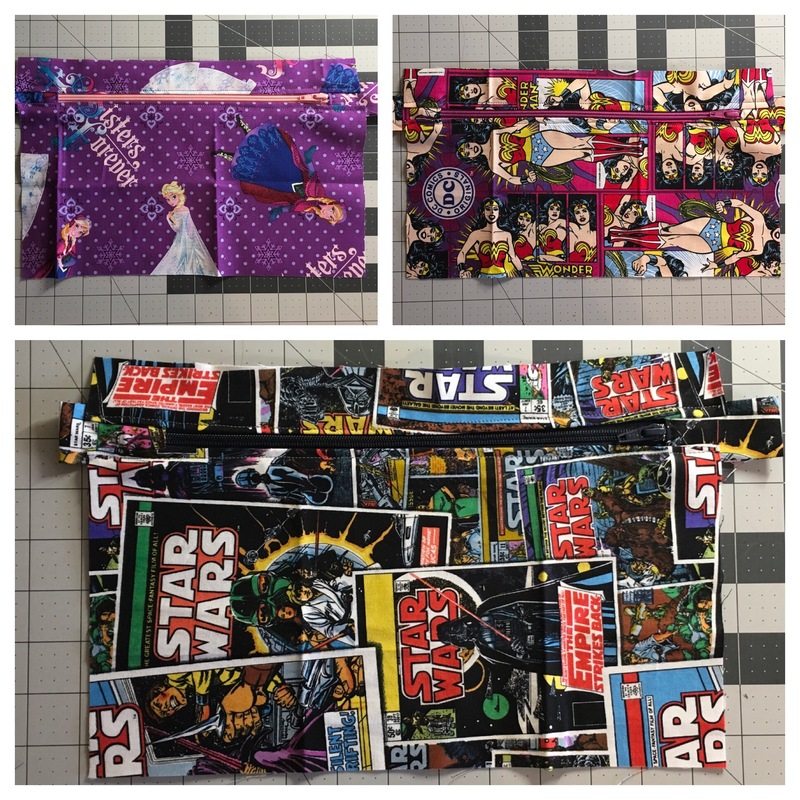 Sew another 2 1/2 inch pattern fabric and 1 inch strip together. Iron both flat and sew the two pieces together matching the pattern to the solid fabric. 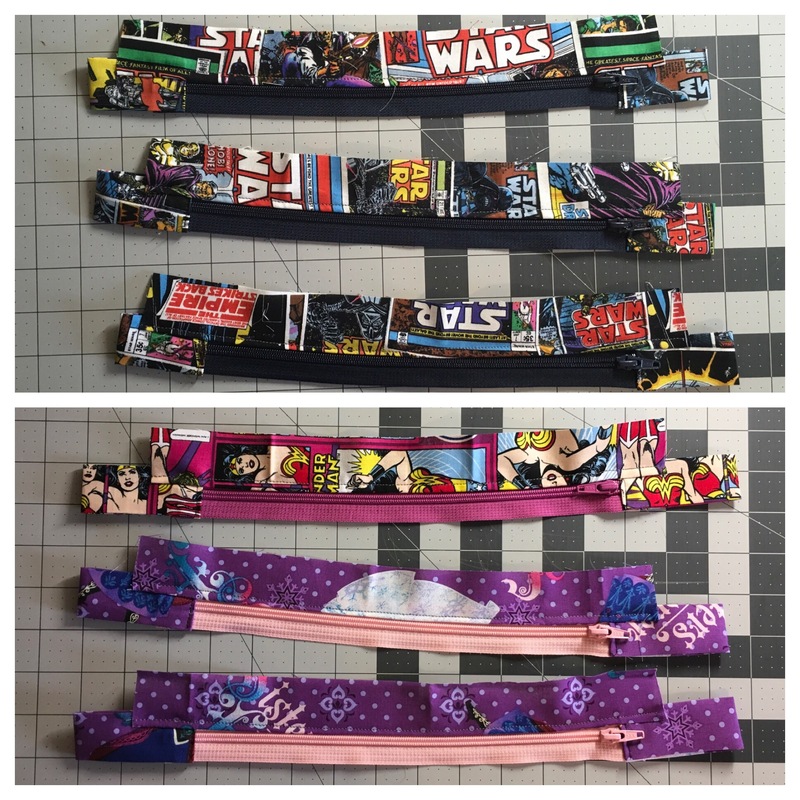 Finally sew the last 2 1/2 inch pattern strip along the 1 inch solid strip. 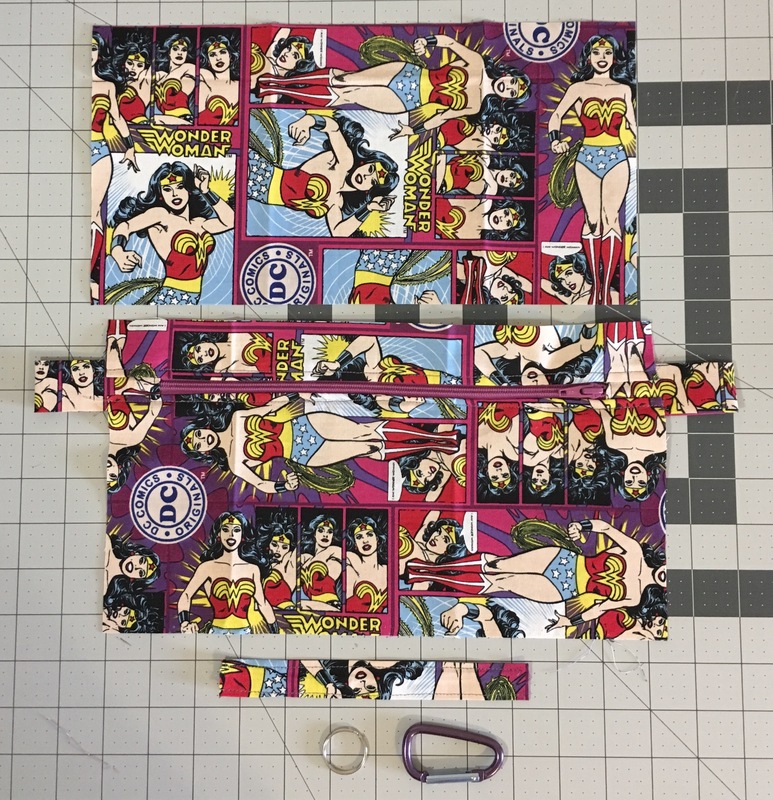 You will want to do the same with the other solid 2 1/2 inch strips and pattern 1 inch strips. Make sure to iron between steps. How that you have a long strip of board pieces cut them 2 1/2, make sure to cut 3 pieces per tick tack toe board you are making (per side). Cut two strips 1 inch wide that are the length of each piece, this should be about 7 3/4. 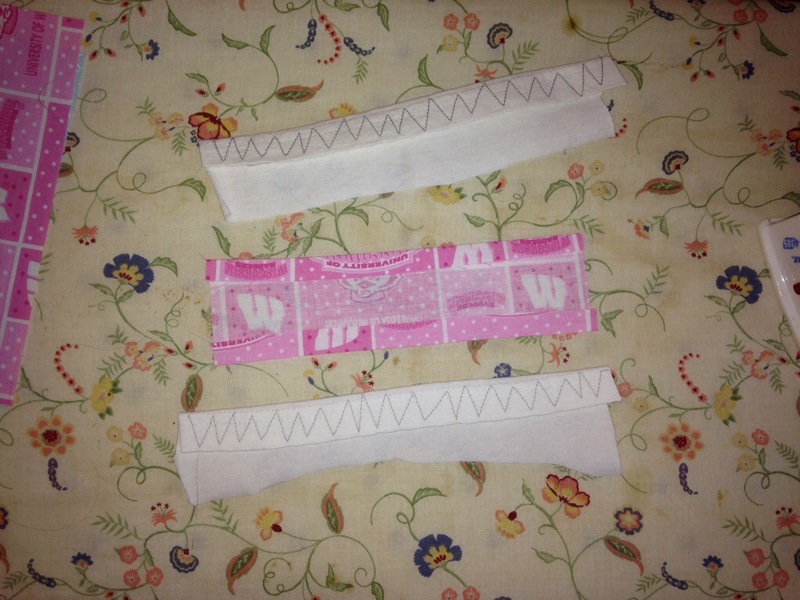 Sew the two strips between the three pieces similar to the first step above. Make sure to iron between steps, and once the board is finished press it really good! 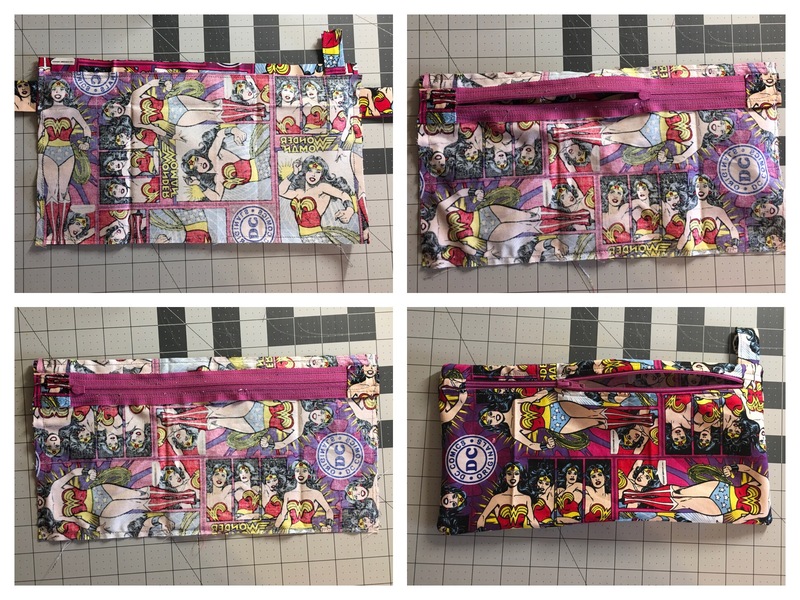 Take your front and back pieces and place them with the nice fabric on the inside. You may want to trim any fabric that does not line up nicely. Sew along each side leaving about an inch or two to flip it right side out. Turn it right side out and use a chopstick to shape the corners. Iron after turning right side out and be sure to iron the opening you used to turn it right side out so it’s easy to close it up when sewing along the edge. Sew around edge and it’s done! I purchased some large buttons from Amazon that worked really well for playing pieces! 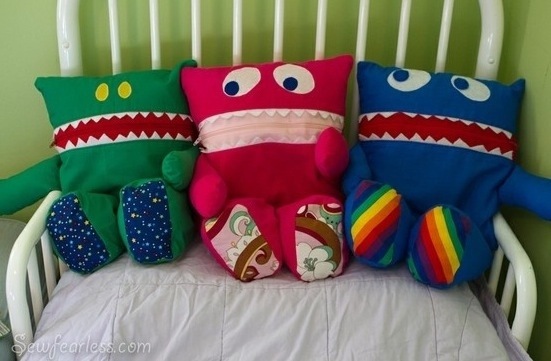 They are all cute, fun and most important everything is washable! If you have kids, you know it can be a challenge to get them to sit for too long. I used to stash some crayons and paper in my purse, but I just didn’t feel like the extra clutter anymore. I also thought, as the kids got older, that different things would be fun to include. 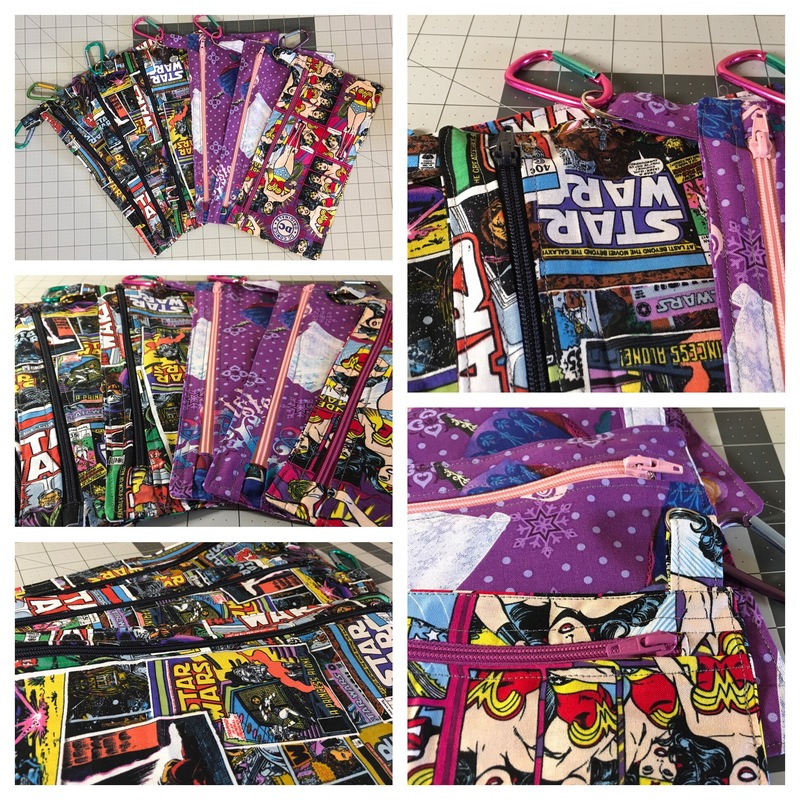 This post will just be about making the bag, but you can fill them with just about anything! One think I decided to stay away from are caryans because I didn’t want them to melt in the car, so I picked up some washable markers. 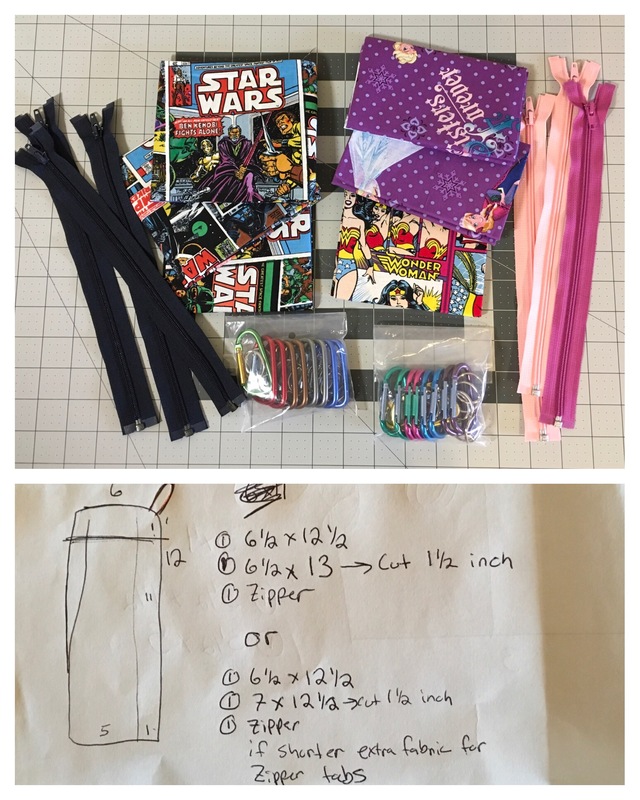 I started with material, I picked up one fat quarter per bag, one zipper per bag, and a clip. I thought 6×12 would be the ideal final size. 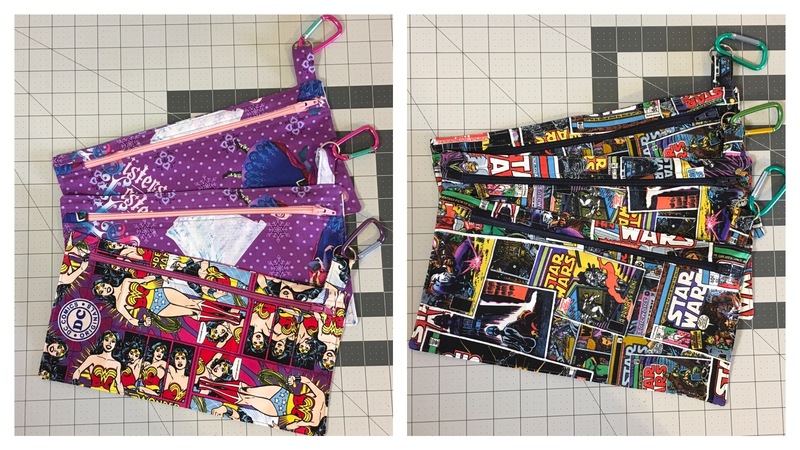 I also wanted the zipper to go along the long end, and I wanted to give zipper tabs a try! Below is the final overview of what I used, each is per bag. 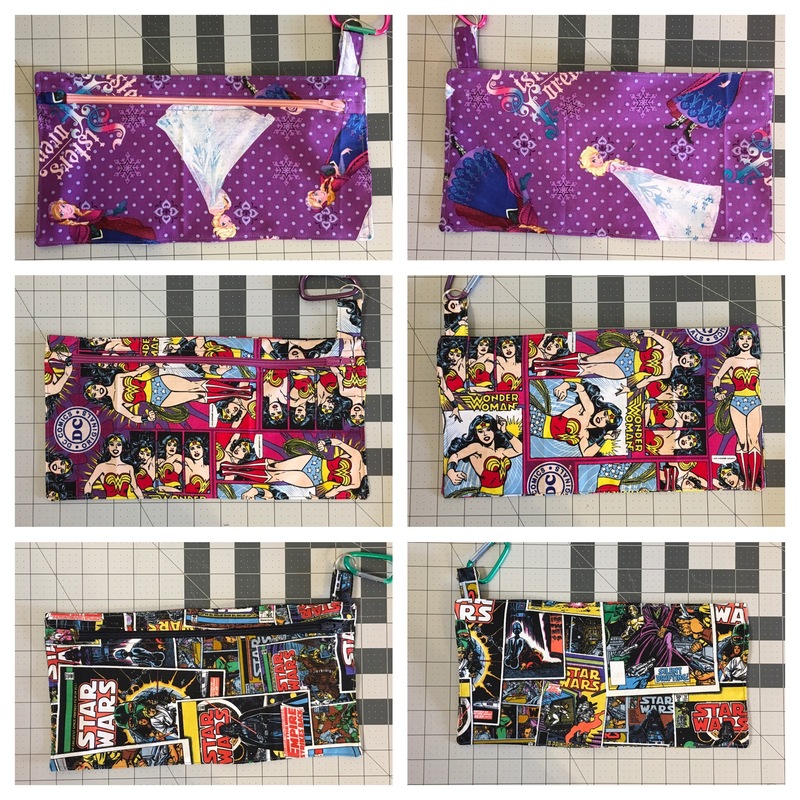 Start by cutting your fabric for each bag. Before cutting the zipper tabs check to see if they need to be longer than 6 inches (keep in mind it will be folded over, so I allotted about 2 1/2 inches per side). 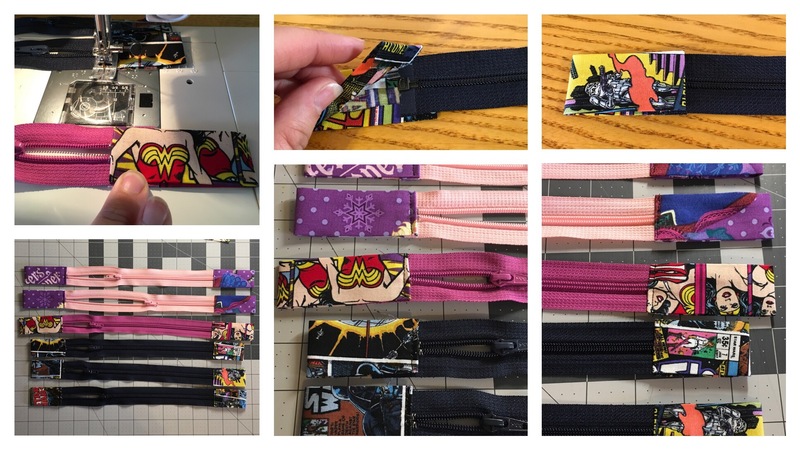 Zipper Tabs – The first thing I did was get the zipper ready, this started with making the zipper tabs. 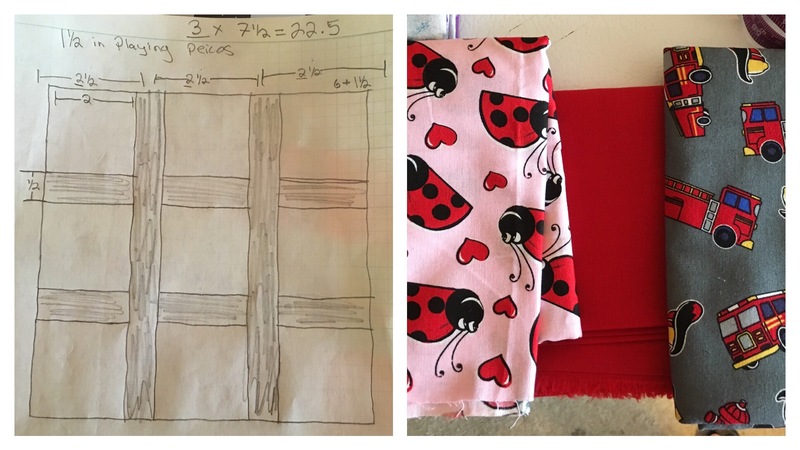 Take your 2 x 6 inch pieces, two per bag and iron flat. On one of the long ends iron about a 1/4 inch seam. 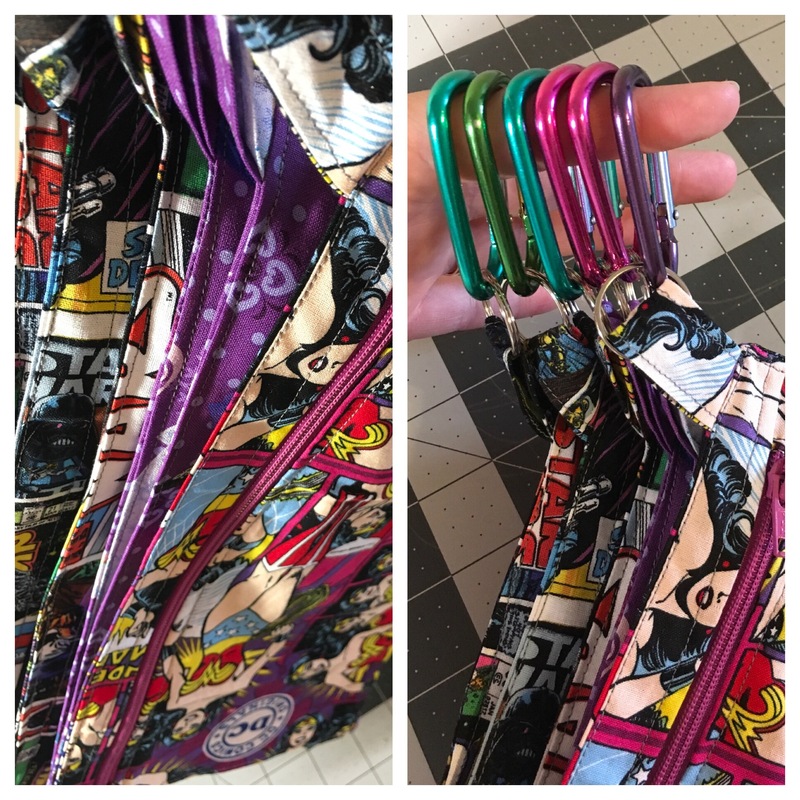 Take your zipper and slide it under the first seam and fold over the excess fabric to get the tab the same width of the zipper. Pull out the zipper before ironing, do not iron the zipper! Iron a 1/4 inch seam on both short ends. Last step is to fold in half and press all seams. The tabs are now easy to be seen onto the zippers. Time to sew the zipper tabs! 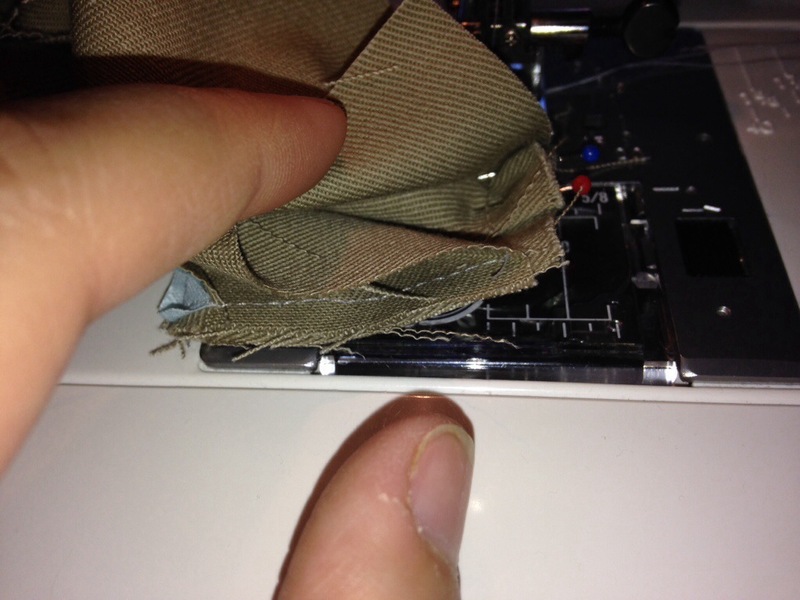 You need to avoid sewing on the metal, so keep that in mind when positioning the tabs on the zipper. 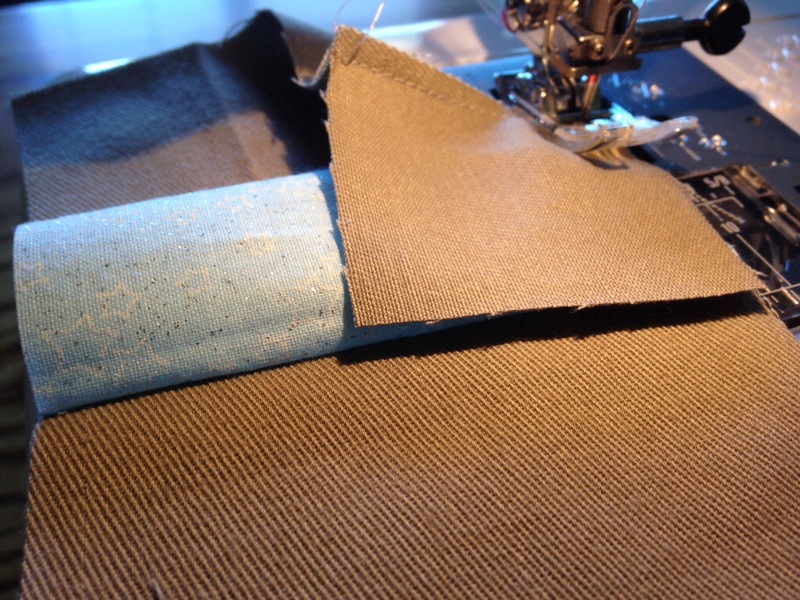 When sewing the Bergen I get of the zipper, unzip slightly and use your fingers to keep the two pieces in place. Now that the zippers are completed, it’s time to sew the two front pieces onto the zipper. 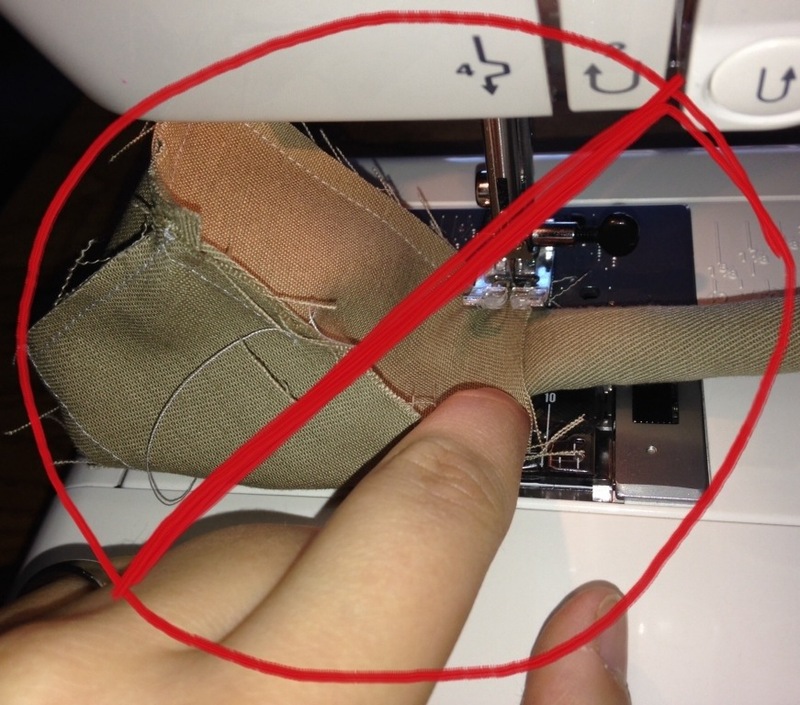 Make sure to use your zipper foot, if you don’t have one expect to ruin a zipper or two if you aren’t perfect. 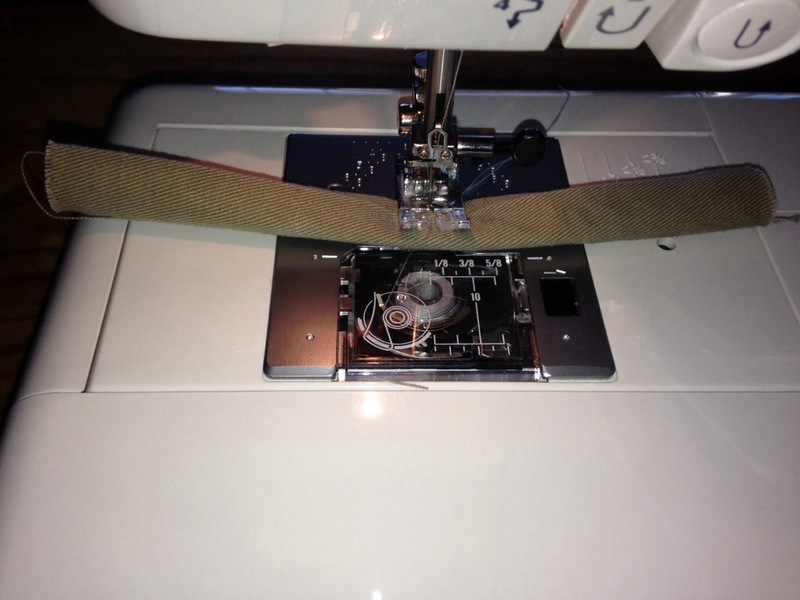 My machine came with one, once I figured out I had it – it has been a lifesaver! Make sure the zipper is zipped all the way up, lay the zipper down with the zipper pull on the left side. Take your small front piece and lay it on top of the zipper, look at the two ends to make sure the zipper is as even as you can. Put it on the sewing machine with the zipper pull on the back of the machine and have the needle a little bit below the zipper pull. My zipper had wide fabric attached, so I offset my fabric a little bit. See the bottom images for the example. Once you’ve sewn all the way down, the next step will be to un-zip the zipper and finish sewing the top part. Flip the piece of fabric right side up and sew along the zipper, you should be able to go the entire length without hitting the zipper tab. I always like to do this to give it a nice finished look and to also help secure the fabric. I’ve also found if I don’t sew along the top like that, the zipper can get caught in the fabric from time to time. Attach the bottom front piece similar just like you did the small top piece. Make sure to also sew along the top. 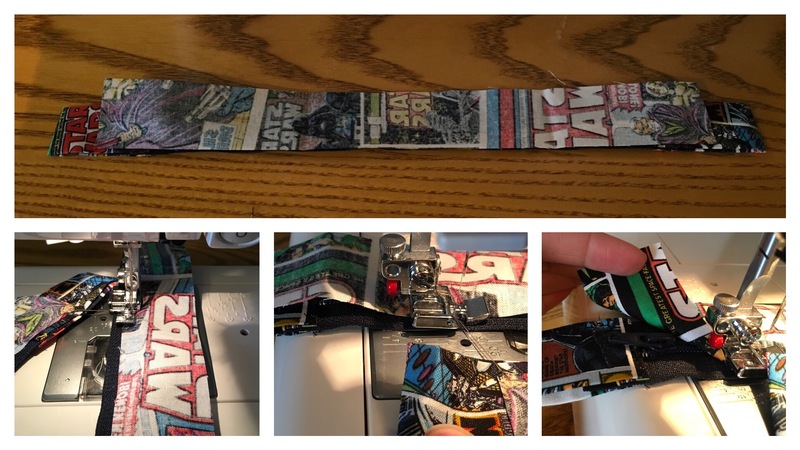 After you finish the front piece it’s time to work on the key chain strap. 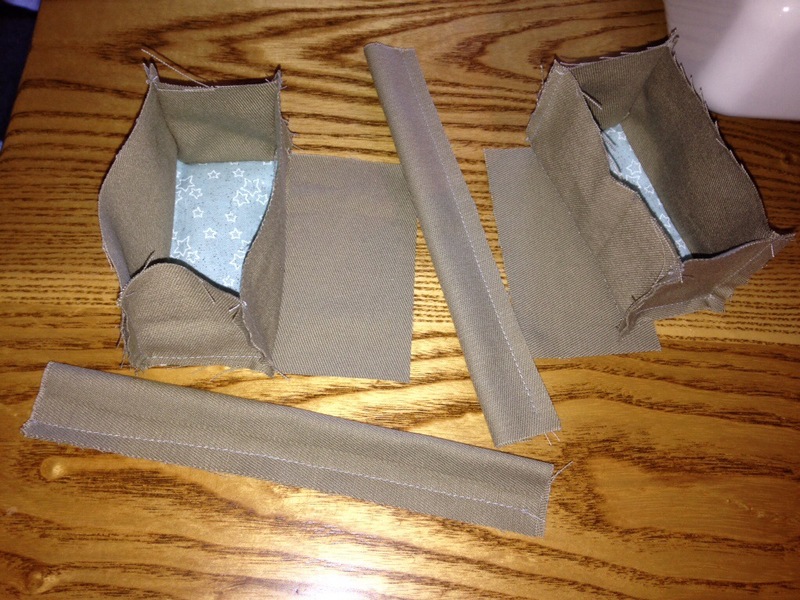 Fold the piece over and sew along the long end. Turn the pieces inside out and iron flat. I like to make sure the seam is in the middle when I iron. Sew along the two edges to finish. Now that all three main pieces are done it’s time to start laying them out. Start with the front zipper piece. I opened the zipper just slightly, then took the keychain piece (with keychain) and placed in the top right corner right next to the zipper pull. I didn’t want the keychain piece to be too long so I lined it up with the base of the zipper. After I put the keychain holder in place I used a clip to keep it in place. Then lay the back of the bag facing down on top of the front piece. After lining it up I clipped all four corners to get ready to sew. 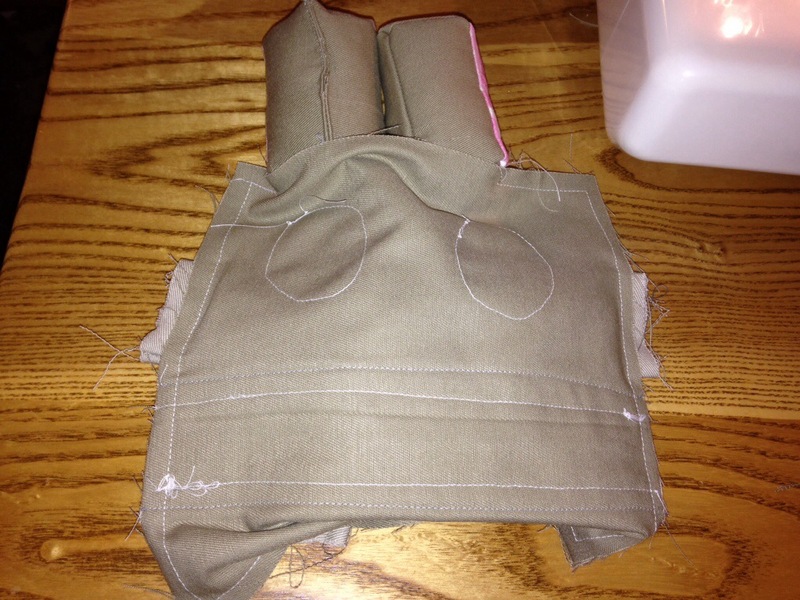 Sew along all four corners, you do NOT need to save a hole to turn it right side out becasue you have the zipper. I always check to make sure I stitched correctly around all edges before I turn it over. Trip off all extra fabric, then open up the zipper and turn right side out. Turn the bag right side out and iron the edges. Be very careful to not iron the zipper, if you do it might melt and not work. 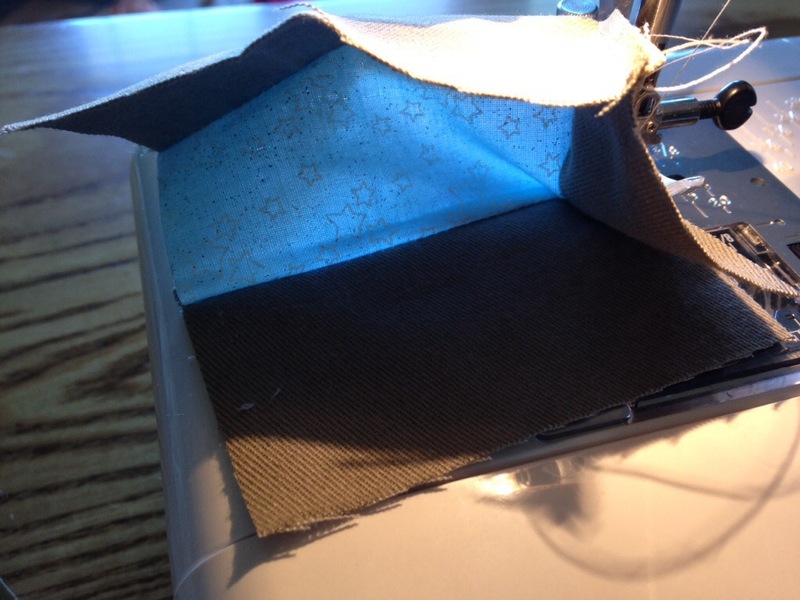 Sew along the four edges to give it a nice finished look. Attach the clip and your all done! Here are a few more pictures of the finished prodcuts! 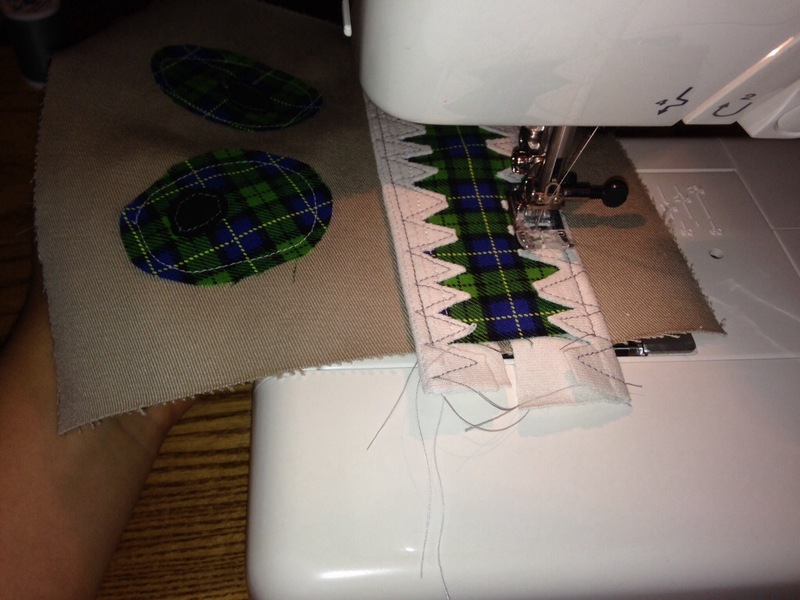 Looking back at the pictures on my phone and past blog posts I realize I missed at least one sewing adventure. 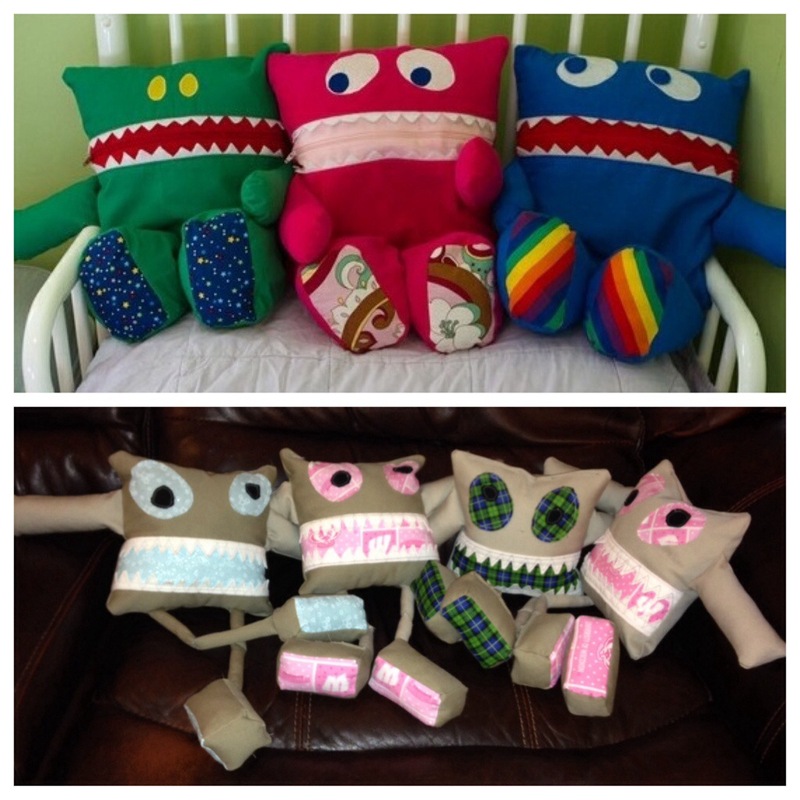 Enjoy the below post about how to make your own stuffed Animal pattern! 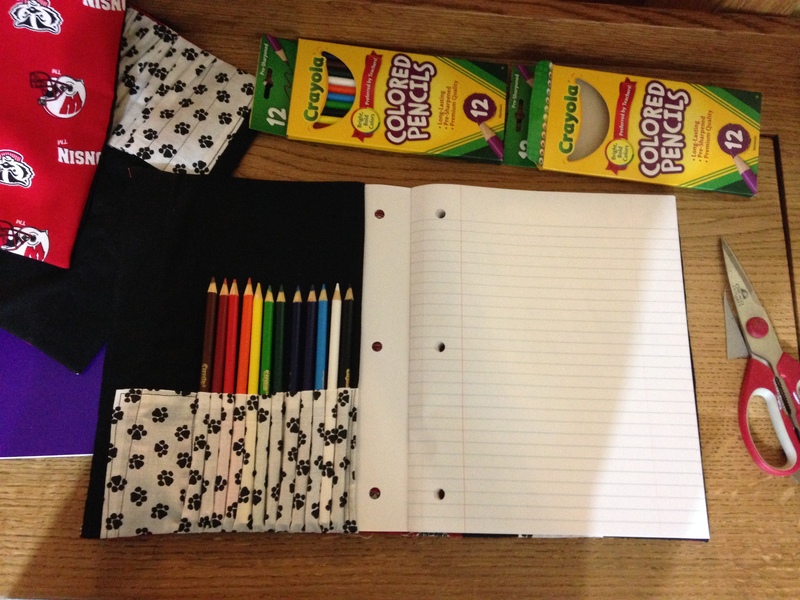 Back to school is a great time to pick up supplies to make notebook covers that also have a spot for colored pencils. 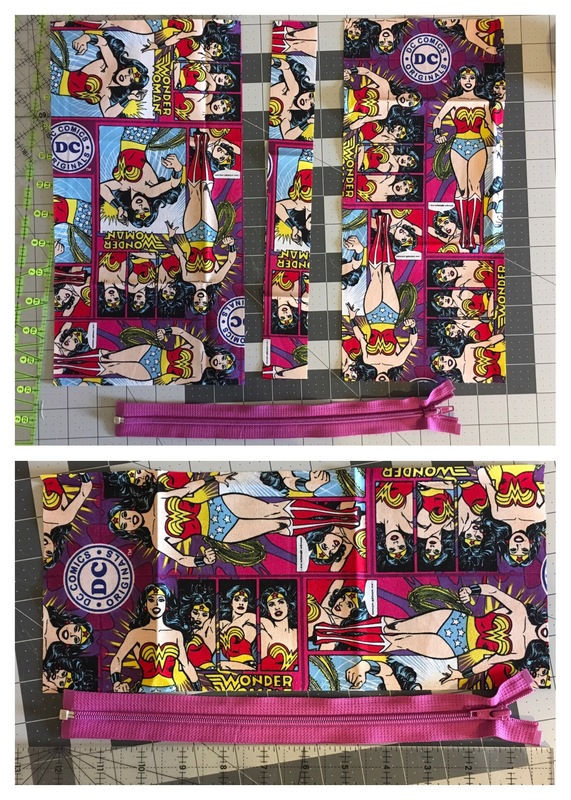 This was yet another just sew project, it was also a bit rushed so I didn’t do a good job making the pattern, if this turns out as well as I expect I’m sure I will have another post that fills in the gaps. A friend of mine asked about making bean bags, so when my youngest was invited to her first non-family birthday party I thought some homemade bean bags was in order. I made three sizes because I wasn’t sure what was the best size. 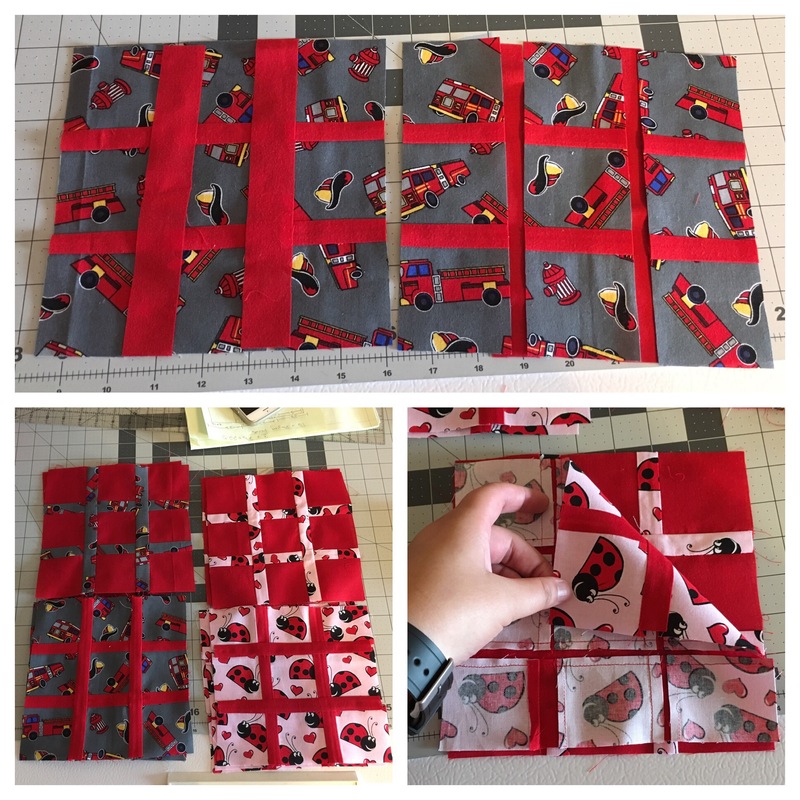 I cut 6 inch squares, 4 1/2 inch squares, and 3 inch squares. The 4 1/2 seamed to be the Perferct size. Start by cutting your squares. 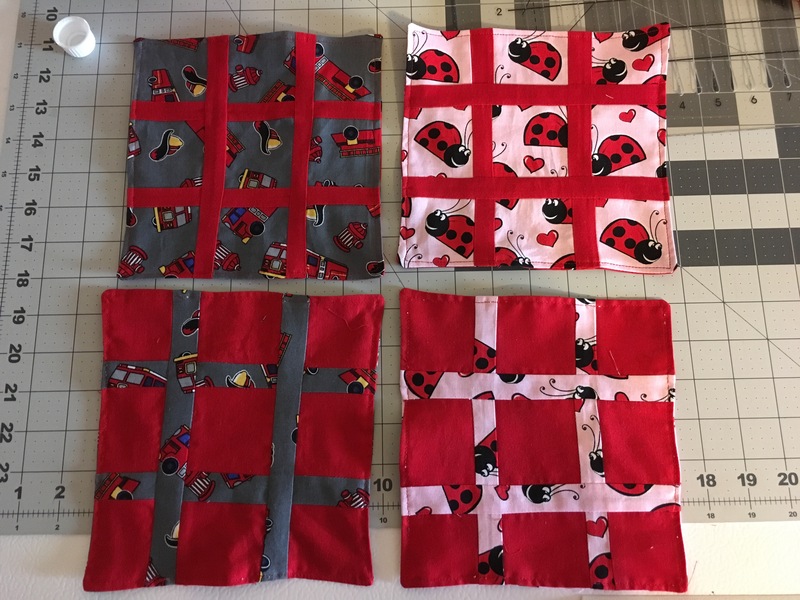 I found the smaller sizes cutting the 3 inch squares was best so I could get the pattern to fit the best. For the larger sizes I cut a rectangle 6×12 and 4 1/2×9. Put the pieces inside out and stitch around, leaving about an inch. Then turn the pieces inside out and if necessary use a chopstick to push the corners out. Normally this is where I would iron, but I didn’t think that was necessary for this project. Then I used a funnel to fill with rice. I tried to sew it closed using the machine, although I liked my bags a bit full. For all the bags shown below I used a total of about 2.5 bags. Hand stitch and you are good to go! I had fun warping this gift, no tape necessary! My kids liked the bean bags so much that I made them their own set, and I’ll be making another Thomas batch for a friend. 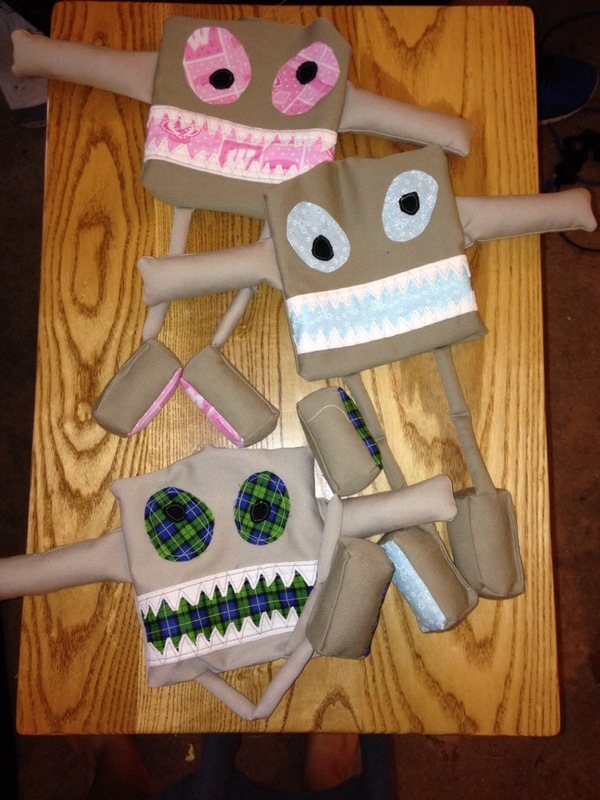 As I was trying to think of an idea to make 3 toddlers for a birthday party I went to Pinterest and found inspiration in a Monster Pillow. The pin only had the image, so I decided I would make something similar. 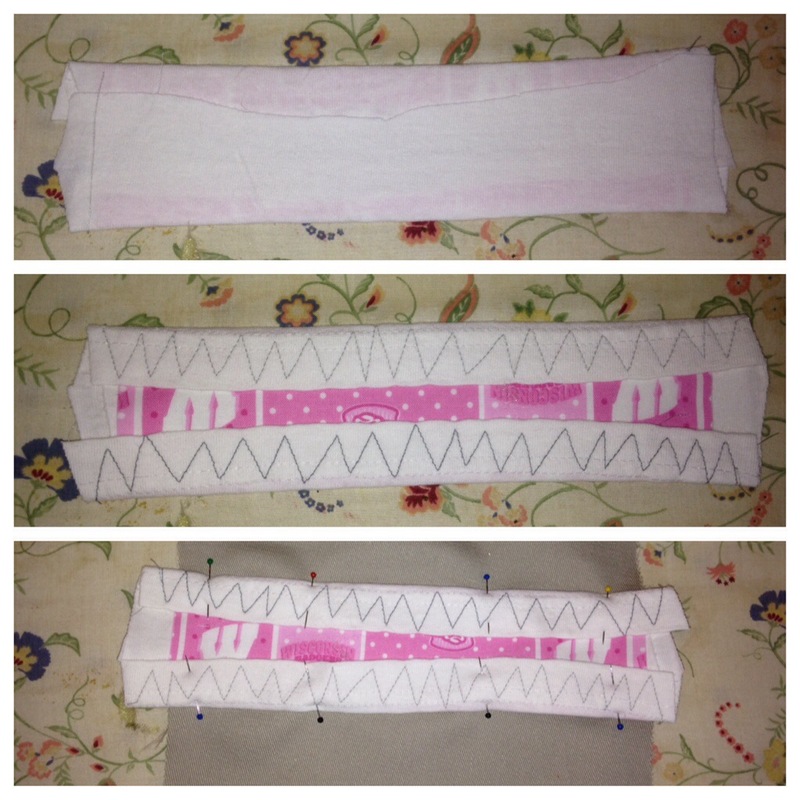 Fabric for Teeth, I used the bottom and arm seam on a white t-shirt. Felt might work really well for this. 2 smaller circles for inside eyes. Then I started with the feet, I decided to make them a rectangle. Start with the bottom piece and sew the two sides onto the bottom piece. Then, take one of the back or front pieces and sew it first on one side, then when you are a stitch or two from the corner lift up the foot and twist the back or front piece to line up with the bottom piece. Then do the same thing again with the last side of the foot. Once done, it should start to hold it’s shape a little. Do the same thing to other square piece of the foot. 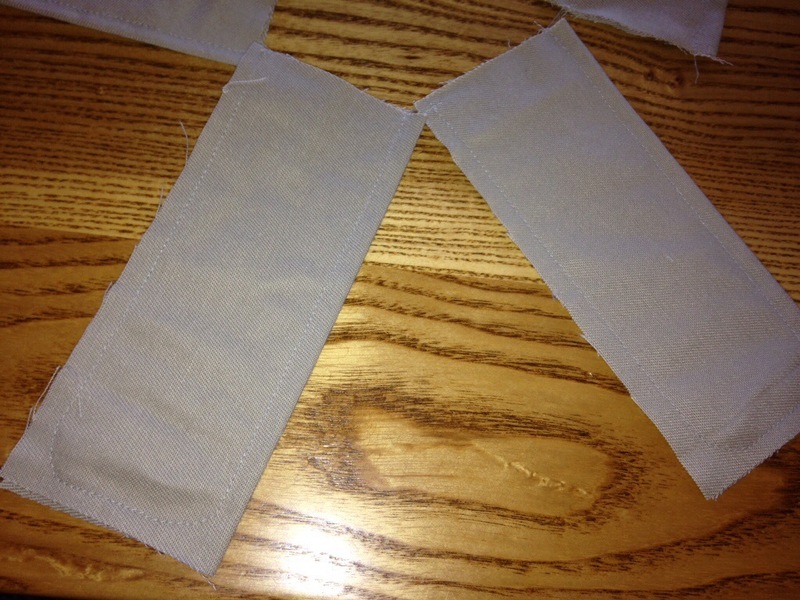 Next Take the two leg pieces and fold them the hotdog way and sew along the line. 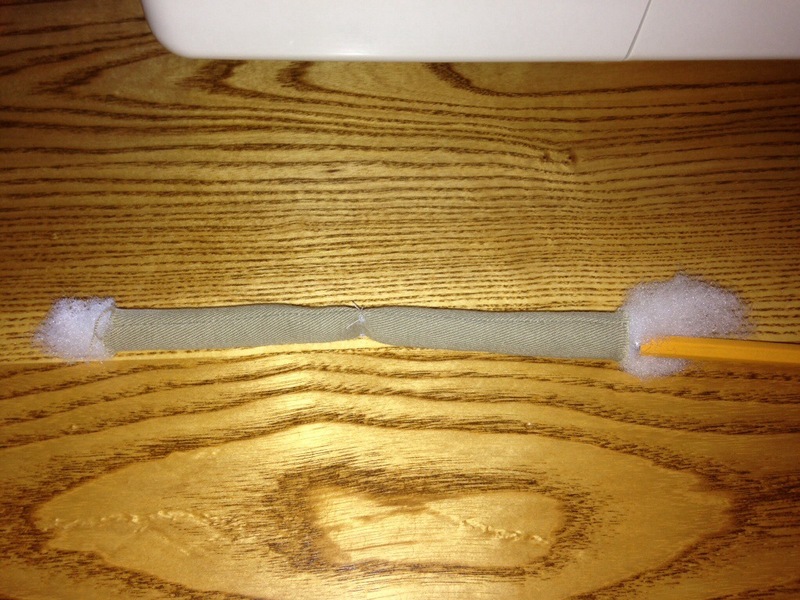 Turn it inside out (I used the eraser end of a pencil), and sew along the middle of the leg. This will be the “knee” of the Monster. Fill both ends with stuffing, again the eraser end of the pencil works great for this. Pin the leg to the foot, make sure it is inside out! The leg should be tucked away inside the foot, with a little of one end sticking out. Make sure when you sew the top on that you leave a hold to turn it inside out. Next, fold the arm in half the hotdog way and sew three sides,leaving the base of the arm open. Turn everything inside out and stuff with stuffing, this is a great task for a toddler! Next, make the teeth. I cut the bottom of my white t-shirt off, and measured a little more than 8 inches long. For both pieces of teeth sew zig-zag teeth. Iron the two long sides of the mouth over, then iron the teeth. 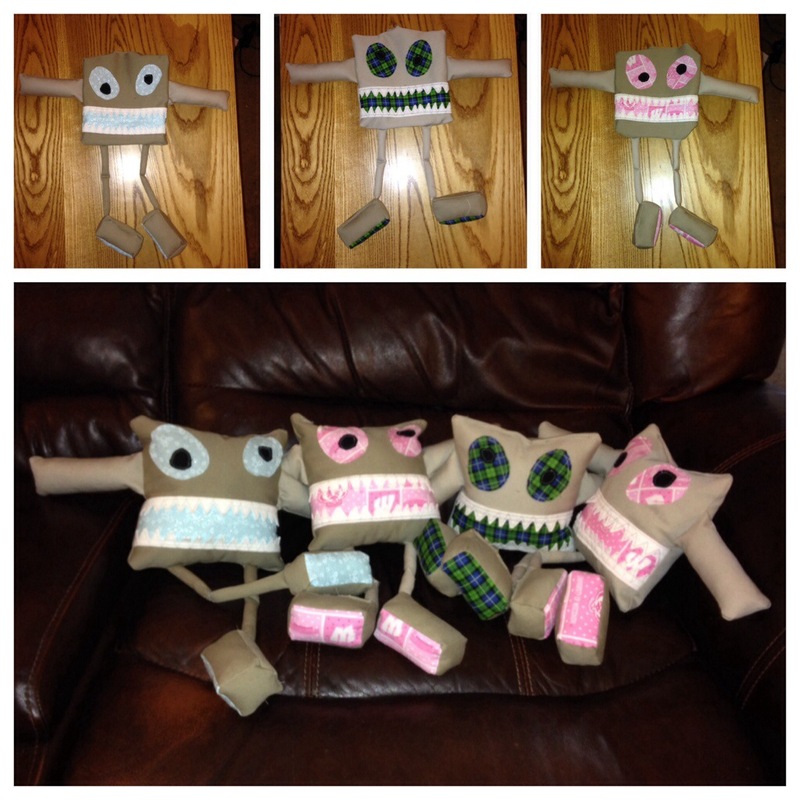 I then ironed the mouth, upper and lower teeth together, and pinned on the bottom of the pillow. Sew the mouth and teeth onto the back, but make sure you sew once along the edge. 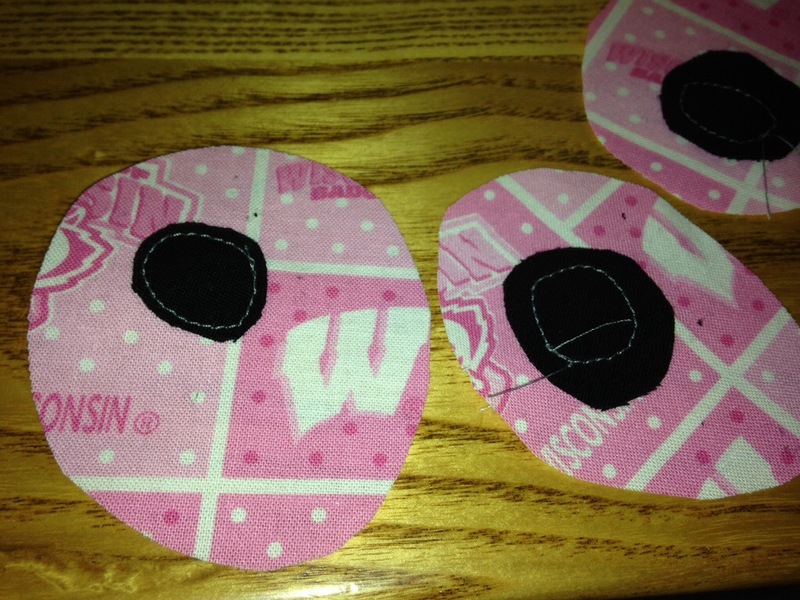 Then cut out the teeth, and sew one more time so the teeth don’t fall apart or move around too much. 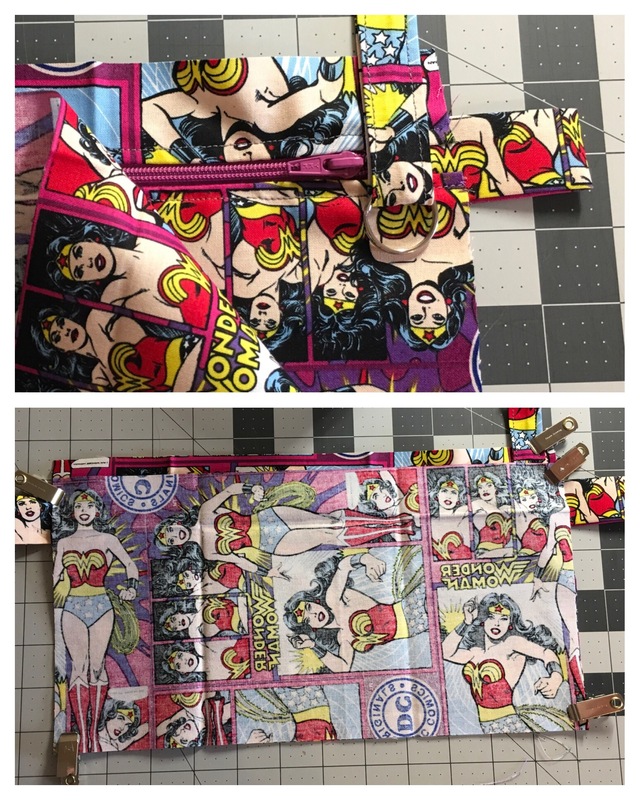 Now, sew all pieces together. I pushed the stuffing in a much as I can for the legs and arms. I left an opening at the top of the head to turn it inside out. I also found it worked well to keep the foot part of the legs sticking out of the hole at the top. Turn right side out, stuff, sew up the hole and your done! I am still around. 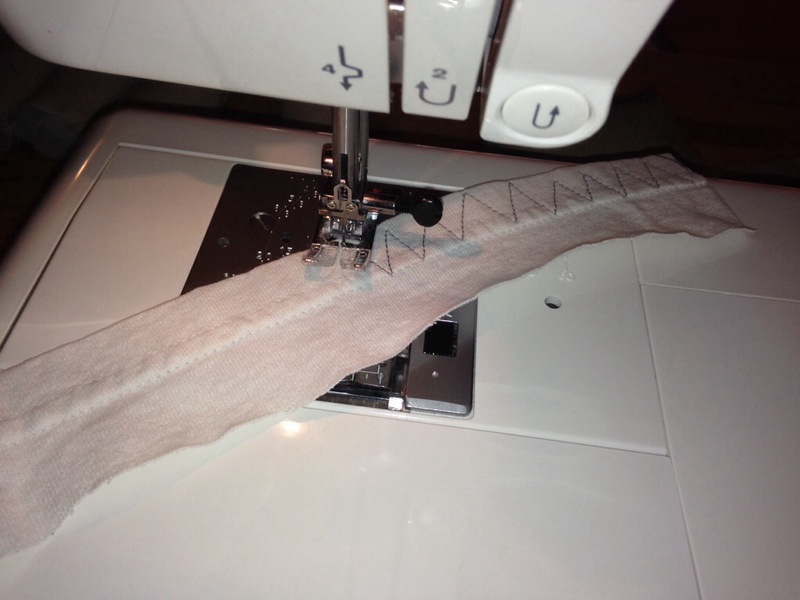 I am still sewing…Well more so I am finally back to sewing. I was just finishing up my last semester of school and one thing led to another. The good news is I am finally back on track with my hobbies! 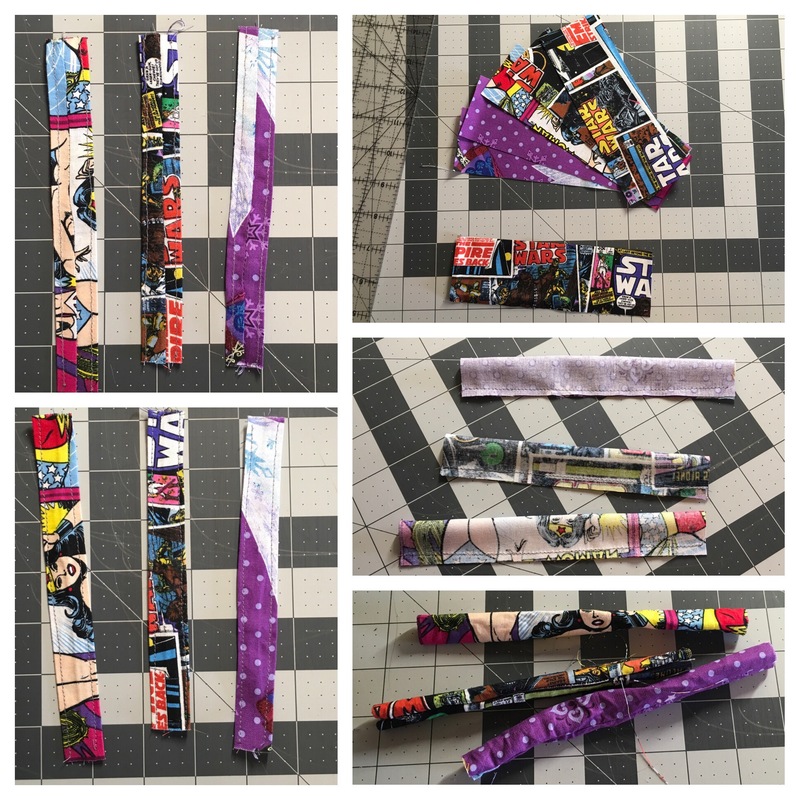 I think the blog did a great job explaining how to do things, so if you decide to give this a try check out the tutorial for step by step instructions. 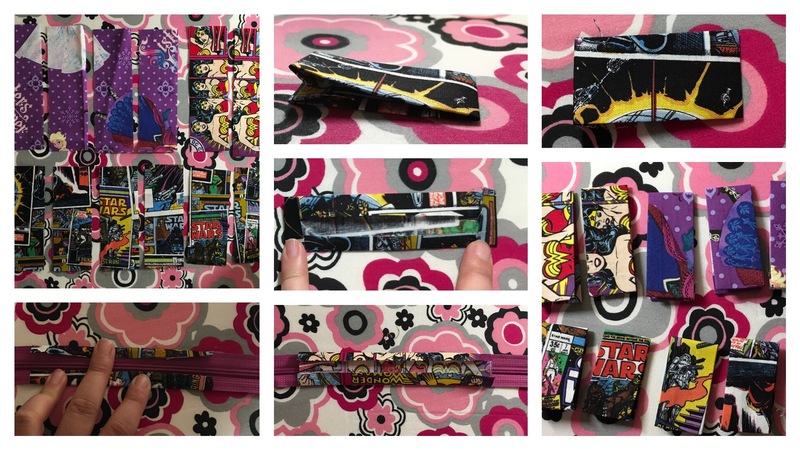 While I love the blog, the design of the wallet is not something I would make again. I should have looked at the measurements to see how big it really is. The wallet does not fit well inside my son’s pockets, but that does not stop him from loving it! I was surprised by the size so I compared it to my husbands bi-fold wallet and it was larger. I think if I made it again I might make a few more modifications to make it a little smaller like rotating the cards inside section 90 degrees. I decided to give that a try, but knew I had one modification I had to make. He needed a place to put his change. I followed the pattern exactly, except for that one modification. Here is the fabric we choose. 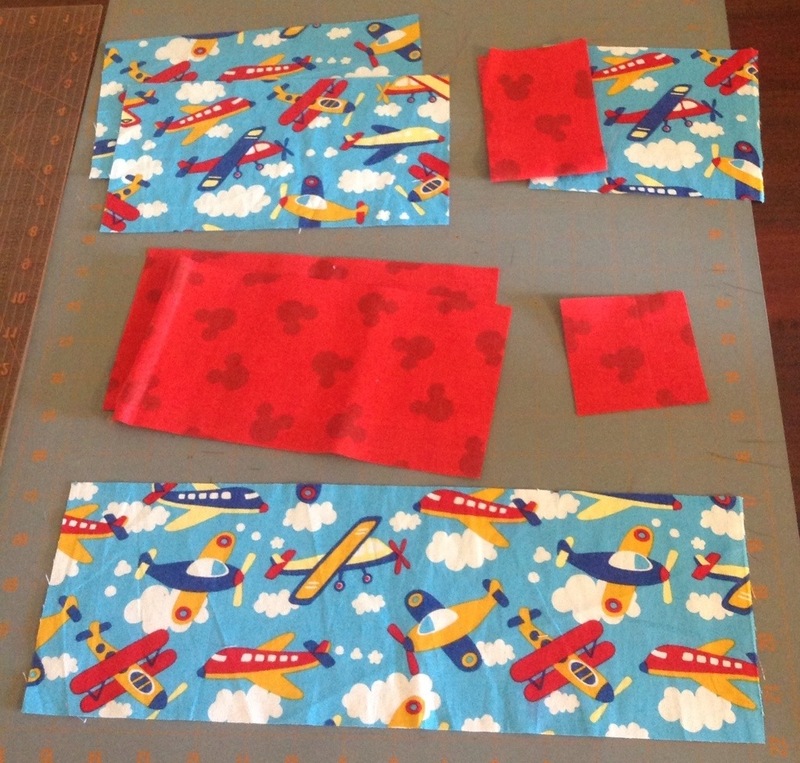 He wanted airplanes, and I had some scrap Mickey fabric that went very well with his airplane choice. After cutting all the pieces out I decided to start with the coin section first. 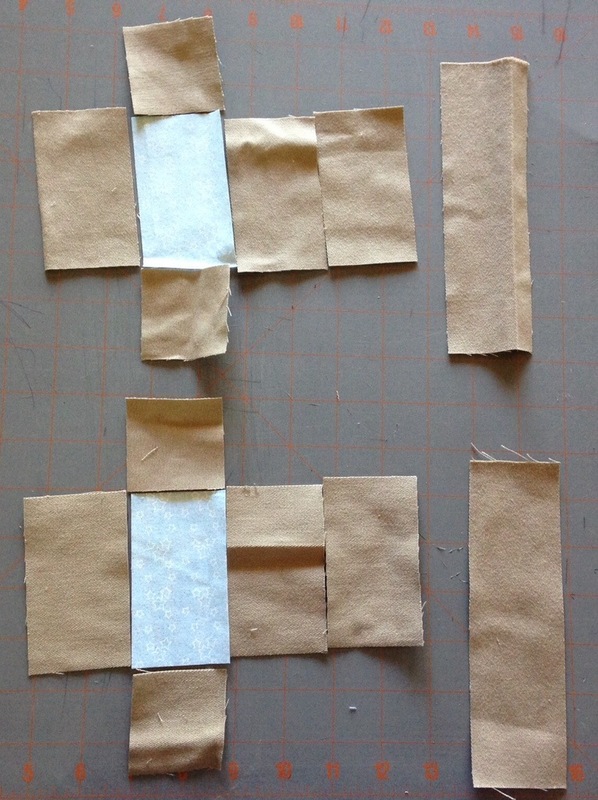 I found a rectangle scrap that I folded in half then left a hole while sewing to turn it inside out. After turning it inside out I made sure the hole was tucked in, then I ironed it flat. Next, I used Velcro to keep the pocket closed. 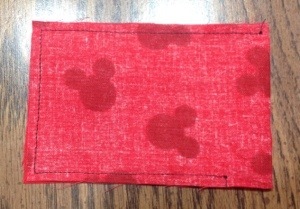 I found another spare piece of the airplane fabric that was used as the back of the coin section. 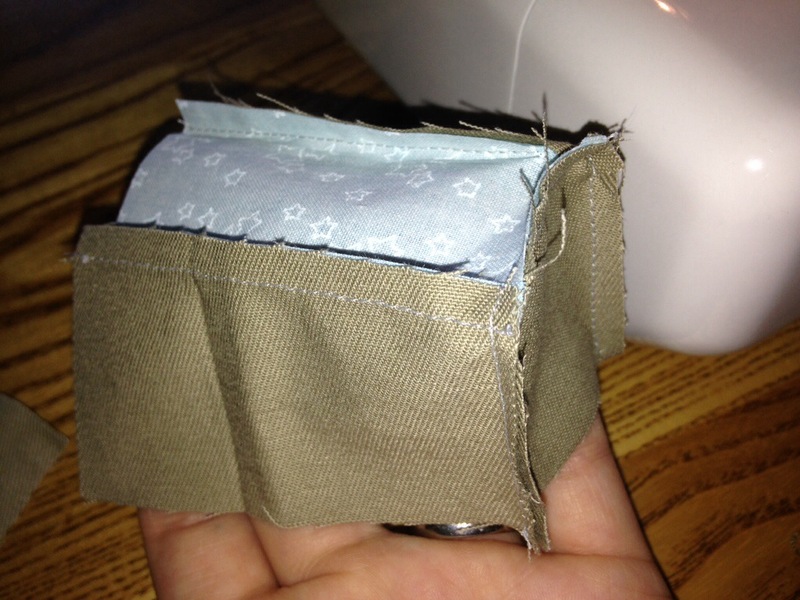 I wanted to make sure that no coin was lost, so I sewed the entire coin section together before sewing on the wallet. 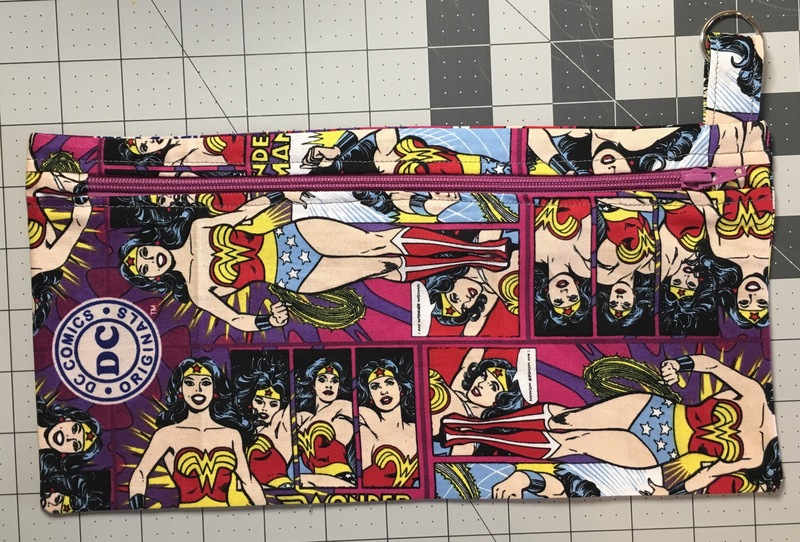 I also decided I didn’t need the fabric to be folded over the entire back, just enough to make sure the front part folds over nicely. Note that in the first picture I folded over the sides and bottom to make it the right fit. 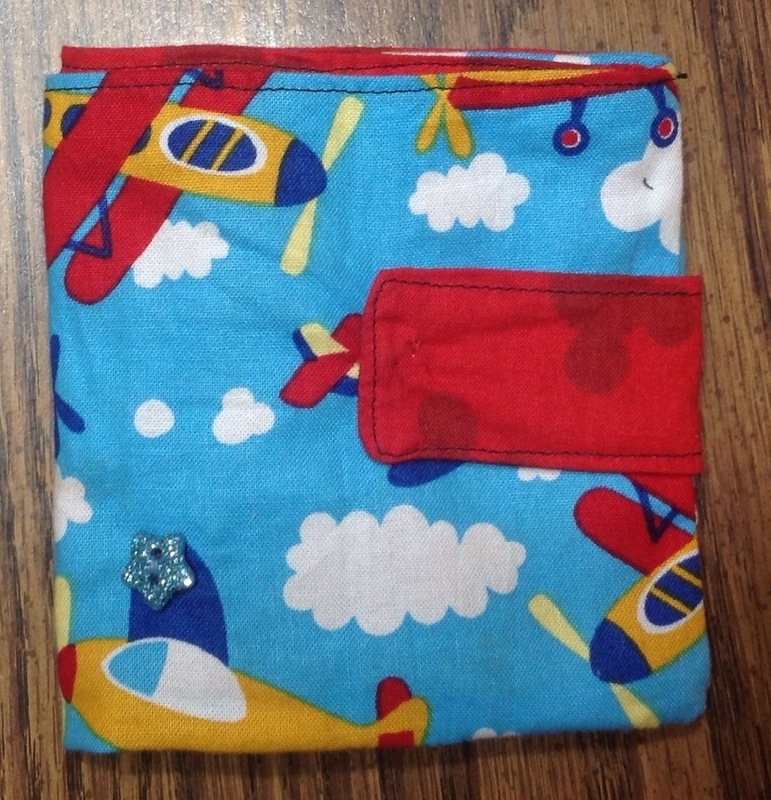 When I sewed it on the wallet I pinned both pieces down and sewed over it, the airplane fabric is larger because it folds over. 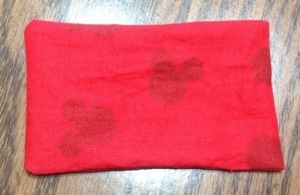 This is what it looks like after I sewed both inside sections on. Also note that I left the coin section to be smaller in width. This was just a guess on my part, the size of it seemed to work out well. Here is the final product! I love the color, its really cute and my little man just loves it!